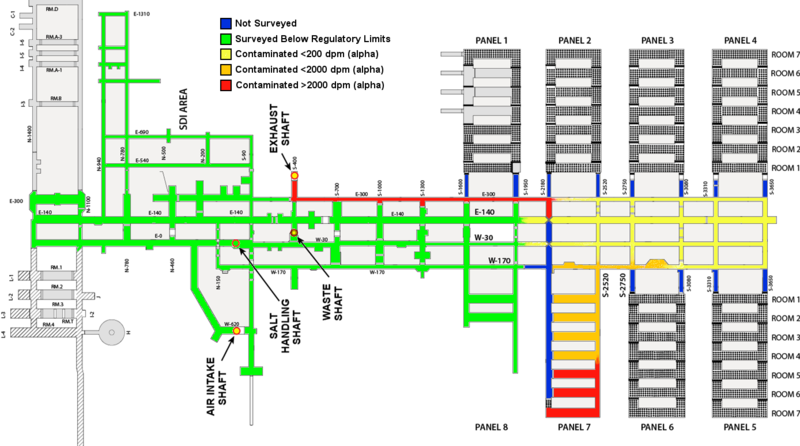 The attached “direct frisk” map shows surface contamination measurements on the floors of the drifts in specific areas of the WIPP underground. All measurements are in units of dpm/100cm2. The data represents a snapshot in time from February 2015 when the measurements were made and levels may have decreased through water spray mitigation efforts and the hygroscopic nature of the salt. The surface values on the direct frisk map were used to develop the second “contamination distribution” map which delineates the areas of the underground into areas classified as highly contaminated, contaminated, contaminated below 200 dpm/100 cm2, below regulatory limits and those areas where surface survey work had not been completed at the time the map was produced. This map has been used for a number of public presentations over the last few months. In the aftermath of the February 14 event, the WIPP environmental sampling program was supplemented with additional sampling. Sampling is being done on air, soil, surface water and sediment, and vegetation. Sampling for airborne radioactive particles helps determine if there has been an increase over background levels of alpha-emitting radioactive material. There is a background level of plutonium and other transuranic materials from the past atmospheric testing of nuclear weapons. Air sampling is performed weekly at seven monitoring stations. A total of 47 air particulate filter samples have been obtained since the February 14 event. Slight amounts of americium and plutonium were briefly detected at four sampling locations. All air filters since February 18 have shown no detectable americium or plutonium. Click the following to view air sampling data. Routine soil sampling occurs at the WIPP site in areas around the air sample stations. Thirty-three soil samples have been obtained since February 14. An additional 29 samples are planned in the near future. All soil samples (except one) analyzed to date have shown no detectable americium or plutonium. The one exception was a detection of plutonium that is not considered to originate from the February 14 release because the location is not in the downwind direction, the sample shows no americium and the same location has shown similar concentrations of plutonium in past years. Click the following to view soil sampling data. WIPP has 14 locations for routine regional and local surface water and sediment sampling that extend as far north as Artesia, New Mexico, on the upper Pecos River, to as far south as Pierce Canyon on the lower Pecos River. Since February 14, six samples have been taken from catchment basins at WIPP. An additional 17 samples will be taken by the end of the month. All of these samples showed no detectable americium or plutonium. In addition, a rainwater sample was collected in duplicate from puddles on site rooftops, a downspout, and a puddle on a paved surface. Both duplicates showed detectable americium. One showed detectable plutonium. The americium and plutonium maximum concentrations combined represented about three percent of the U.S. Environmental Protection Agency’s drinking water standard for alpha-emitters. Click the following to view water and sediment sampling data. Vegetation samples are routinely taken at WIPP. Since February 14, seven additional vegetation samples have been taken from six locations near the air sampling stations. An additional 29 vegetation samples are being taken this month. All samples analyzed to date show no detectable americium or plutonium. Click the following to view vegetation sampling data. Salt mined from the underground is kept in a large pile on the northern side of the WIPP exclusive use area. As part of the monitoring activities, WIPP is analyzing samples taken from various areas around the salt pile. Sample results show no detectible levels of radioactive contamination. Click the following to view salt pile sampling data. Other routine sampling continues at the WIPP site, which includes trapping and analyzing quail and taking samples from road-killed wildlife. Click the following to view the wildlife sampling data. The Carlsbad Environmental Monitoring & Research Center (CEMRC) is a division of the College of Engineering at New Mexico State University. The CEMRC facility and staff provide support to WIPP primarily through site and environmental monitoring, in vivo bioassay, and scientific and laboratory support. The Savannah River National Laboratory (SRNL) analytical report presents detailed chemical, physical and radiological properties of samples collected in association with the February 14 radiological release underground. Airborne particulate samples and swipe samples were analyzed. Air particulate (dust) samples were collected by filtering air through a porous paper. Swipe samples are simply cloth-like material used to wipe a surface for a collection of the material. The results indicate the nature of the material that was released into the air underground near the breached container. The particulate captured on the filters appears to be generated by a combustion process, and its chemical and radiological signatures are similar to the waste stream in the breached waste container that contained nitrate salts and organics. The swipe samples also indicate that the airborne particulates were large enough to settle on nearby surfaces, and contaminate most of panel 7. The swipe samples have the same chemical and radiological composition as the particulate samples. Click the following to view the report.